Apple surprised everyone, including me, by announcing that it sold a record setting 9 million iPhone 5C/5S units during the launch weekend. Following this announcement, some have questioned the basis of my projections and suggested that it was not based on data, but on "blind belief" in theory. As a result, I have decided to publish my estimates and methodology for peer review. My goal was to find a metric that measured demand without being contaminated by supply constraints. With this in mind, I focused on a single data source - Google trends. Google trends measures search volume for various keywords, with data available for global and local searches. In order to construct a "demand indicator", I measured cumulative search volume for the following keywords - "iPhone", "iPhone 4S", "iPhone 5", "iPhone 5C" and "iPhone 5S" (search volume for "iPhone 6" was negligible"). Unsurprisingly, the queries for the first keyword vastly outnumbered those for all other keywords, except during product launches. I restricted the "demand indicator" for weekend sales to search volume during the week of the iPhone announcement and during the following week when sales opened. The region-wise data backed up these results - search volume declined by 25-40% in every major region except Japan & China. Japan saw ~20% growth in search volume, which could be explained by the addition of NTT DoCoMo. While China saw a smaller, ~10% decline in search volume, which could be explained by rumors of a cheaper iPhone & a China Mobile deal. 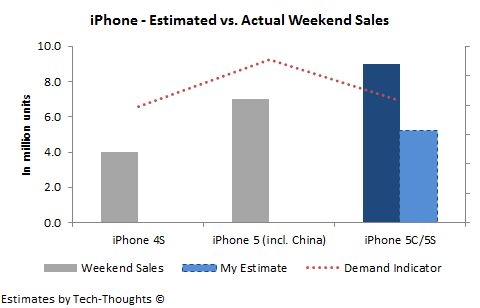 This data suggested that weekend sales would be in the range of 4.5-5 million. Unfortunately, this turned out to be woefully low compared to the actual figures announced by Apple. But why did I consider Google search volume to be a reliable "demand indicator" in the first place? The following estimate would answer that question. The chart above shows "demand indicator" data consolidated by quarter plotted against Apple's reported iPhone shipments. 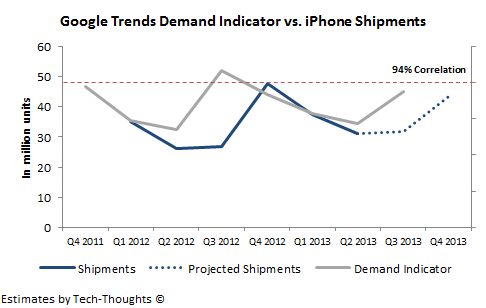 Google trends' data is a leading indicator for iPhone shipments, with a correlation of 94%. Since most iPhone sales are subsidized, my hypothesis was that this was caused by search queries made in advance of contract expiry. This gave me considerable confidence in using Google trends data as a reliable proxy for demand. Using this methodology, I estimated calendar Q3 iPhone shipments at 31-33 million units and calendar Q4 iPhone shipments at 40-45 million units (~5-15% YoY decline). Even if this did not completely account for demand from China Mobile, a YoY decline in the holiday quarter suggested a significant shift in upgrade behavior and demand patterns. 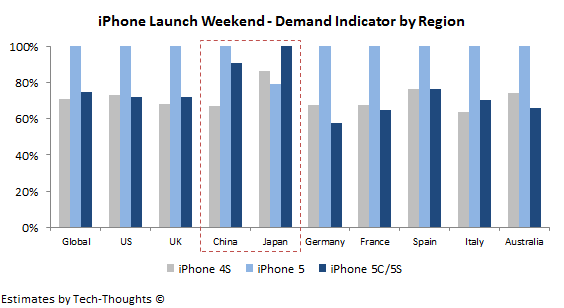 This was also consistent with my hypothesis of weak iPhone demand, especially since it would include a full quarter of China sales and sales from NTT DoCoMo. At this point, I have no reliable data to pinpoint the exact cause of this disparity, so I will leave that as an exercise for readers.